There is a lot of bourbon out there to be tasted, and acquiring it can become an expensive proposition – especially if you decide that what you’ve purchased isn’t quite what you thought it would be. That’s where samplers come in handy. 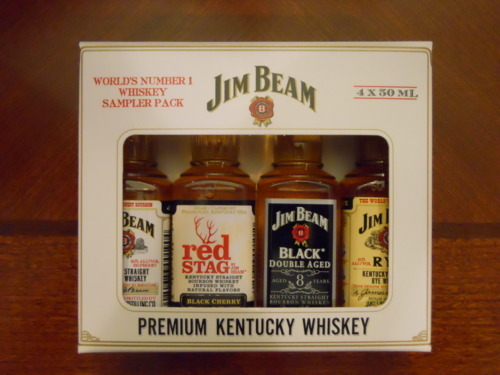 I bought this Jim Beam sampler pack on sale for around $5 at the Party Mart in Brownsboro Center mainly because I wanted to try the black cherry-infused Red Stag without making a big commitment (which turned out to be a wise decision). For the next few days, I’ll share my tasting notes with you. Let’s start with the Stag. Aroma: Jim Beam says that Red Stag, which is 4-year-old Jim Beam bourbon infused with black cherry, has a “distinctively fruity” nose, but I smelled cough syrup – Robitussin, maybe. Taste: Very, very sweet, like bourbon mixed into a cherry Icee, but with a lot more warmth. Slightly oily mouth feel. Very smooth, pleasant finish. Verdict: After that whiff of cough syrup, I had pretty low expectations for Red Stag, but I enjoyed it more than I thought I would. I wouldn’t buy a full-size bottle, but I could see ordering it on ice at a bar during summer. For what it’s worth, Red Stag is a proud sponsor of Kid Rock’s Born Free Tour. This does not give it extra points in my book, but taste in music varies at least as much as taste in bourbon, no?